One of the most prestigious awards given by the Oregon State University College of Agricultural Sciences is the Hall of Fame Award. The College bestows this award to recognize individuals who have made outstanding contributions through at least one or more of the broad areas covered by the College of Agricultural Sciences. In 2017, we are proud to announce that one of our own, Professor Emeritus Emery Castle, has been awarded the Hall of Fame Award, and he will be honored in October by Dean Arp at the Dean’s Dinner. During his six decades as an active and internationally respected scholar, Dr. Castle has contributed greatly to OSU, the people of Oregon, and the discipline of economics. Dr. Castle came to OSU in 1954 and over the next 22 years served as Professor, Dean of Faculty, Department Head, and Dean of the Graduate School. 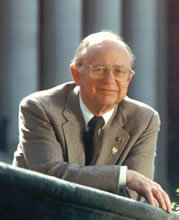 In 1976, Castle joined Resources for the Future (RFF) as vice president and senior research fellow. He served as president of RFF from 1979-1986. In 1986 Castle returned to OSU as Professor and served as Chair of the University Graduate Faculty of Economics until 1992 when he was awarded emeritus status. Castle chaired the National Rural Studies Committee from 1987 to 1997 and served as the inaugural Director of the OSU Rural Studies Program from 2001 to 2004. He is a fellow of the American Agricultural Economics Association, the American Association for the Advancement of Sciences, and the American Academy of Arts and Sciences. He was awarded the honorary degree, Doctor of Humane Letters, by Iowa State University in 1998. Dr. Castle and his family have been long-time supporters of OSU Foundation. Their generosity has enabled OSU to establish the Emery N. Castle Chair in Resource and Rural Economics and the Emery N. Castle Scholarship to Graduate Students. Congratulations Emery! if you would like to honor Emery and his support for graduate education, please think about donating to the Emery N. Castle Scholarship here.